In 2006, Providence Downs started a summer swim team to promote a community program and the sport of swimming. 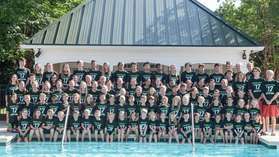 The swim team is part of the Greater Charlotte Swim League (GCSL). The Racing Sea Horses have achieved many successes and awards such as Sportsmanship, Division Champions and All Star Champions. To join the swim team, swimmers need to be able to swim one length of the pool unassisted. Also, families must be residents of the Providence Downs neighborhood and in good standing with the homeowner's association. Swimmers range in age from 4 to 18 and abilities from novice to year round competitors. We promote participation and work with the swimmers to achieve the goal of being part of the Sea Horse team. Please contact us at pdseahorses@gmail.com.